The coolest thing I saw at NAB 2014 this year? 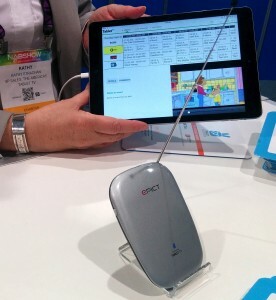 Tablet Television – a neat consumer TV product that’s sort of the anti-Aereo. Not only does it turn mobile devices into real TVs, it’s coming from an interesting alliance of companies. First the features. Smaller than a deck of cards, this little device includes two ATSC tuners, a wifi hub, 4 gigabytes of storage and the smarts to convert over the air TV signals into a WiFi stream of bits inside the house. Turn it on, load the android or IOS app on your tablet or smartphone, and suddenly your favorite mobile device turns into a TV. Although it’s limited to WiFi – which means it’ll only work at home or in the office – it’s far superior in quality to the ATSC-M/H mobile broadcast standard which was designed to support mobile/handheld with a sub 480i image. The device also includes 4 gigabytes of on-board storage for basic DVR functionality, and can be expanded via a mini-SD slot to 64Gigabytes or more. It’s a nifty device that could really turn our tablets into TVs. Due out in September, the device on display featured a rough interface, and only supported a single device at a time. Pricing has yet to be determined, but it’ll likely be in the $100 range, with no additional fees for watching over-the-air broadcast. The company plans on offering premium services, such as Netflix and Hulu Prime, although they had nothing to announce at the show. Built by Motive Television, a UK-based creator of mobile video services, it’s a slick solution. But even if they don’t make a dime on premium services, it’ll still be a win for Motive’s partner, Granite Broadcasting Corporation – which owns 14 local TV stations around the country. As a sort of “anti-Aereo”, this device will let Granite control how its signals are consumed by consumers, not a disruptive third party. Although the company only plans to create apps for Android and iOS, when I suggested Roku, FireTV and AppleTV, the developer got that far away look and said, “hmmm, I hadn’t thought about that”. I hope they do, it would make the device far more useful! I’m excited to see how this product works – and who knows. Maybe you’ll even be able to watch Revision3, TestTube, Animalst and Sourcefed on the service as well! The device is not limited to wifi. It is portable. The device receives the digital signal and then wifis the content to your devices. You can use this anywhere that you can get a TV signal, that’s the beauty of it. Interested in knowing if they were smirking when they answered your question concerning Roku, FireTV, and AppleTV. This tech will work with ANY existing hardware. They have something called Content Express that is a cheap and fast way of adding TabletTV to any broadcaster or cable companies hardware. Ask the directors if they have any under the radar deals with Apple. It won’t get answered. Yeah, I should have focused more on the portability – you do have to bring it with you, of course. You can’t leave it at home and then use it to stream if you are across the country, ala Slingbox. Although that would work too. Speaking of which, Sling does the same thing, doesn’t it? We did talk about cable boxes. We will see how that goes.